George Stephan Sr., just wasn’t happy with his open flame brazier. He was looking for something that he could cook with that would give him more control, even temperatures, and a sealed environment to keep out wind and water. Luckily for George, and everyone who has owned a Weber Kettle since, he worked at Weber Brothers Metal Works. George built a new backyard grill out of the metal parts meant for a lake buoy, fashioned some legs for it, and the backyard barbecue was never the same! Stephan started selling the grill locally in 1951, and when word got around that people were loving his invention, he started selling the Weber Kettle commercially the next year. Over the years, the Weber Kettle has gone through some changes, but the overall design remains. A simple round bottom with a dome top that seals around the edge to keep your grill safe from wind and the elements. When it was officially launched in 1952, the Weber Kettle almost singlehandedly launched the backyard grilling industry in America. It has since become an iconic product, not only of the post-war era, but of America as a whole. A distinction not given to many products. 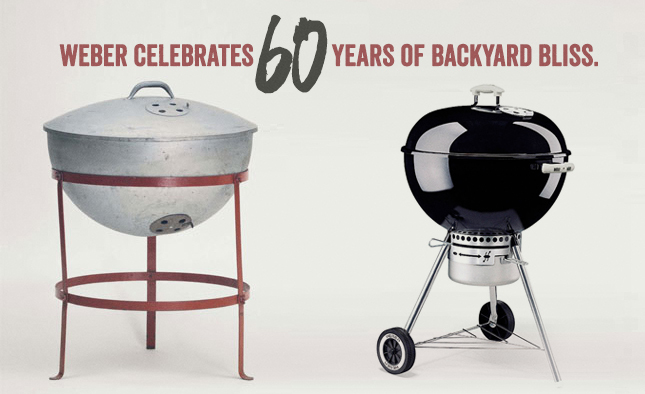 As 60 years have passed, the Weber Kettle still endures as the ultimate symbol of backyard cookouts, and to this day, it is still made in the United States, by Weber-Stephen Products LLC in Palatine, IL. As the years have passed, Weber has introduced a full line of gas grills, starting with the Genesis line in 1985. They have even released small travel electric grills like the Weber Q 240, more accessories than you can shake a stick at, and books covering every area of grilling! Whether someone is looking for a first time grill, or a classic backyard workhorse, the Weber Kettle is here to meet your demands.